The Refinery have launched a stunning new menu featuring an extended range of vegan and vegetarian options and irresistible botanical cocktails. Notably, Peter Gordon (restaurateur and food critic) has created exclusive salads inspired by recipes in his book ‘Savour – Salads for all Seasons’, fusing global ingredients and flavours to create inventive, colourful dishes. Manchester House have released a new taster menu for 8 (£75) or 12 courses (£95) with dishes including langoustine and cauliflower as well as king crab and kaffir lime. The à la carte menu includes seasonal produce such as halibut and braised leeks as well as poached chicken and morel mushrooms. A fresh sprinkling of seasonal dishes have been added to Carluccio’s new breakfast and dinner menu’s. From sharing boards filled with the finest Italian meats to linguine scattered with seafood and seasonal vegetables, Carluccio’s have a host of delicious dishes bursting with flavour. In addition, they have a set 2-course lunch (£11.95) or dinner (£14.95) menu with the option to add dessert for £3. Tattu has welcomed a new summer a la carte menu featuring 17 new dishes and a host of new cocktails. New additions include delicately sweet miso Chilean sea bass dumplings as well as a decadent whole lobster served with wasabi gratin, lemon and lime. Stunning cocktails include Flight of the Phoenix which is made with white rum, poppy and apple. Artisan have launched a new express lunch menu that includes 2 courses (starter and main course) and a drink for £10.95. Popular starters include the mozzarella and garlic flat bread and the spinach and tomato gnocchi. Main courses include rump steak and peppercorn sauce as well as cod fillet with green beans. The lunch menu is available 12 – 5pm every weekday. The Pret Chefs have created a selection of fresh new salads including buffalo mozzarella and pesto, sesame salmon and black rice as well as chicken, prosciutto and avocado. In addition, a deliciously indulgent vegan dark chocolate and almond butter cookie is now available, as well as a mango, banana and coconut milk granola sunshine bowl. A bold new menu featuring dishes full of Spanish flavour, spirit and style has launched at Ibérica to celebrate the arrival of spring. 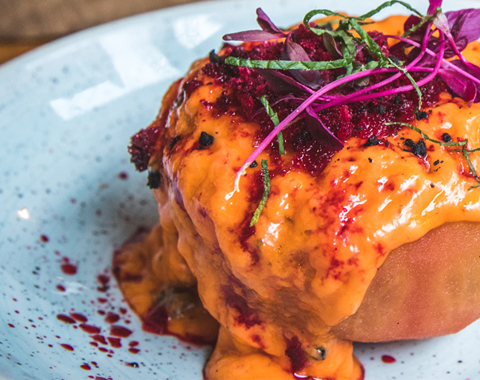 From chorizo in Asturian cider to the 2 Michelin-starred Executive Chef, Nacho Manzano’s poached hake and hollondaise recipe, there’s a delectable dish suited for everyone’s taste. The new spring menu also features gluten-free and vegetarian options, including a delicious dish of sautéed spring vegetables topped with melted Idiazabel, a vegetarian cheese from Navarra. Beastro have released a host of new menus for brunch, lunch and dinner. Delicious breakfast options include buttermilk pancakes drizzled in maple syrup with bacon/sausage as well as a full English breakfast wrap. Standout dinner dishes include the steak tartare as well as the pork and salsa verde. Guests dining may also take advantage of sitting at the Chef’s Table where they may firsthand view the creation of their meals.